October, Halloween is a special time of year to The Blogboard Jungle as we consider it synonymous with horror films. 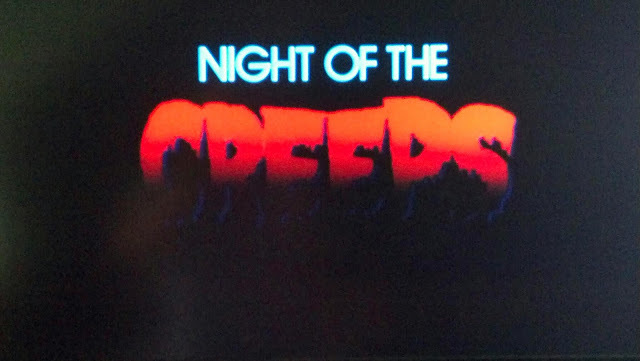 One of the films on our list is Night of the Creeps by Fred Dekker, mostly known for this film and The Monster Squad. This movie starred Tom Atkins as Detective Ray Cameron that seems to always be looking for a thrill and he gets it in this film. Another oldie and cheesy but goodie. Released in 86' and takes place in 86' after a flashback scene that sets the story up from the 50's that is shot in black and white. Some aliens, doing some kind of experiment create these little slug like parasitic creatures that enter the brains of a host to lay eggs and make more slug like creatures. During the incubation period the host walks around like a zombie and tries to insert more slugs in people by releasing them from their mouths into a new hosts mouth. The best way to kill them because of their size and numbers is extreme heat, mostly fire in the film. Being released in 86 some horror films had already gained a lot of popularity and since this film seemed to be a twist, or maybe even a homage of how horror films were done a lot of the characters have the last names of some directors who were associated with horror or sci/fi at the time. The Detective Atkins plays has the last name of James Cameron, the fictional college where it takes place is called "Corman University", after Roger Corman and the boy meeting girl are Chris Romero and Cynthia Cronenberg after George Romero and David Cronenberg. Since we want you to watch this movie we won't spoil too much for you here, but expect to see plenty of head bursting, some pretty decent zombie effects and the requisite 80's explosion for a big finale. The maniac axe murderer zombie is my number two favorite zombie of all time, tar-man being number one from Return of the Living Dead. One thing to note is the ending, there are two of them and the most popular one is the one with a dog (that's all we'll give for now), the other has the burned body of Detective Cameron walking out of the sorority house and falling over releasing a bunch of alien slugs into the cemetery while overhead an alien ship that resembles the one from the beginning is doing a scan of the area. Both endings hint at a sequel so with works. Too bad we never got the sequel.